Sun., June 18, 2017, 8:50 p.m.
SEATTLE – Kelsey Plum drove to her left and found a sliver of sunlight against a surprisingly suffocating Storm defense before launching a midrange runner near the baseline. However, Breanna Stewart, a 6-foot-4 forward with a 7-1 wingspan, closed in fast and snuffed out Plum’s attempt. She caught the deflection while the San Antonio rookie went sprawling to the floor. 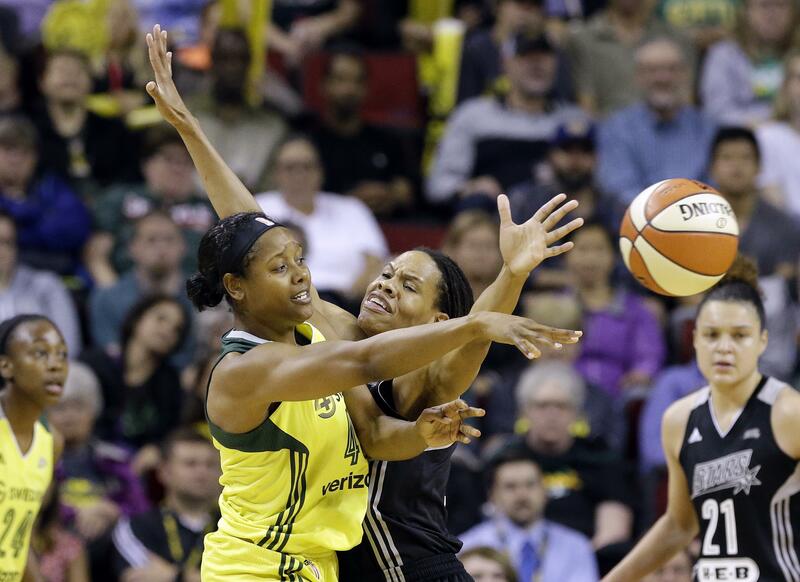 The block sparked a fast break that ended with Sue Bird canning a jumper as the Storm ran away with a 75-57 victory that snapped its three-game losing streak and kept the Stars winless. The fourth-quarter exchange between Plum and Stewart capsulized Sunday’s game between the most recent No. 1 overall WNBA draft picks. Stewart, the top choice in 2016, made the game’s biggest plays on both ends of the floor. When the Stars narrowed their deficit to 37-31 early in the third quarter, Stewart drained consecutive 3-pointers and a long jumper during a personal 8-2 run that negated the threat. Stewart finished with 22 points on 8-for-13 shooting, a season-high 15 rebounds and a career-best five blocks. Meanwhile, it was a rough homecoming for Plum, the former Washington Huskies star who was the first player chosen in this year’s WNBA draft. Plum connected on just 2 of 11 shots for eight points. It matched the most points she’s scored during her short professional career. She played 21 minutes, her highest total in the last three games. But as the KeyArena crowd of 9,686 – the largest of the season – shouted “Kelsey, Kelsey” in the final minutes, Plum sat on the bench. Crystal Langhorne finished with 10 points for the Storm, which improved to 6-5. Published: June 18, 2017, 8:50 p.m.